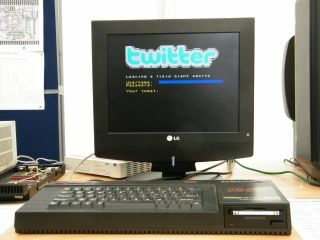 10 - install Twitter for ZX Spectrum... 20 - Make a tweet! This weekend saw The National Museum of Computing host the first-ever British vintage computing festival at Bletchley Park, with hundreds of retro-tech enthusiasts gathering at the computing museum at Bletchley Park to look at, play with and talk about the history of computing technology in the UK. TechRadar was in attendance, managing to use Twitter on a ZX Spectrum – a rather novel experience for a machine which we were more used to playing Manic Miner and Jet Set Willy on many moons ago. Bletchley Park is of course a historic venue in its own right, as it was the centre of Britain's code-breaking efforts in World War II, a key moment in the history and development of British computing. The event, held by TNMOC, proved that computing in the UK has a much greater history than many of us realise, way beyond our fondly remembered gaming machines such as the Sinclair ZX81 and BBC Micro Model B. To top off this year's vintage computing festival's proceedings, Orchestral Manoeuvres in the Dark played a cracking gig, reminding us of many of the things we loved about the 1980s – gaming, music and (at the time) mind-blowing new home computing technologies. REMINISCING: David Caroline from Burton on Trent looking at a 1993 computer motherboard on display at Britain's largest celebration of vintage computing held at The National Museum of Computing, (TNMOC), in Bletchley Park from 19-20 June 2010.